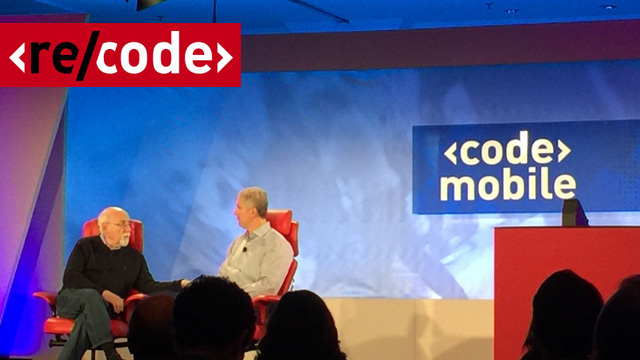 Yesterday and today at the Code/Mobile conference, hosted by Re/code, we’ve heard from some of the world’s most influential tech leaders on where mobile is headed today. Above you’ll see Rick Osterloh, President and COO of Motorola Mobility, as he talks about the mobile industry’s “seven-year itch,” pointing to the near obsessive rise and fall in popularity of smartphones like Blackberry and the Motorola Razr. Still, Osterloh says that Motorola is anything but irrelevant, pointing to the Moto G as the company’s “best-selling smartphone of all time” in its $100-200 tier, helping the company grow at over 100 percent every year. Reality show star and “the gold medalist of oversharing”, Kim Kardashian West made an appearance at the conference, where she talked about how her millions of followers on social media have turned into not only an influential brand, but translated into millions of dollars in revenue for her mobile game, Kim Kardashian: Hollywood. Of the highlights of her interview, TechCrunch reported Kim’s “undying love for BlackBerry… ‘People are horrified that I use a BlackBerry, but I’ll never get rid of it — if you have to handle an email and you have to type fast, I need that board. '” She keeps three in her bedroom at all times in case one breaks and if one does, she scours eBay for additional units. Vice President of Product Marketing at Apple of iPhone, iPod, and iOS, Greg “Joz” Joswiak talked about all things new with the iPhone 6 and iPhone 6 Plus in a panel led by Ina Fried and Walt Mossberg. Besides touching on the anticipated Apple Watch and the buggier-than-usual iOS 8, Joswiak spoke to the surprisingly successful sales of the iPhone 6 Plus as an indication of how people are buying and using smartphones, and how these trends may change in the future. Speck is a proud sponsor of Code/Mobile..